Everyone who plays a sport or engages in any physical activity is likely to sustain an injury at some point. It might be as simple as a pulled muscle, or it could be something that needs serious treatment. Whatever it is, you need to make sure you give it the care and attention it needs before getting back on the horse. You might be determined to get back into it, but if you go too fast, you could end up making things worse. Before you rush to start working out again, make sure you follow these steps to ensure you recover fully. See a Doctor to Determine Treatment – If you hurt yourself, you might need to see a medical professional. It isn’t always necessary, but it’s better to be safe than sorry. If you’re in a lot of pain or things don’t seem to be improving, going to see a doctor will help you diagnose your injury. They can help you work out what’s wrong and provide treatment for you. Depending on what you’ve done, you might be referred to a physical therapist or another specialist. Some injuries may need surgery. For example, orthopedic surgeons cover common meniscus tear and repair for athletes. You might receive painkillers, be told to rest or be given some exercises to do to speed up your healing. Follow Your Treatment Plan – If you’ve been to see a medical professional and they’ve given you a treatment plan, make sure you follow it. If they told you to rest or to do some stretches, they did it for a reason. Don’t ignore them and decide that you’re going to do your own thing. While you should listen to your body and do things when you’re ready for them, you don’t want to move too quickly. You need time to heal, which means sticking to the minimum amount of rest recommended to you. As well as resting, you need to do any exercises you’ve been given to restore your range of motion. Being too still can have a negative impact too. Get Back to It Slowly – When you’re ready to start exercising again, it’s important not to rush into it. If you start off too quickly and try to go back to your previous pace, you could suffer a setback. You should develop a plan to get back into it slowly. Work with your physical therapist or personal trainer to start exercising at a suitable pace. It’s a good idea to keep going with your rehab plan for a while after you feel better. It will help to ensure you don’t do too much too soon. As you get your strength pack, you can start to step it up and try to get back to where you were before. However, keep in mind that with some injuries, you might have to accept new limitations. 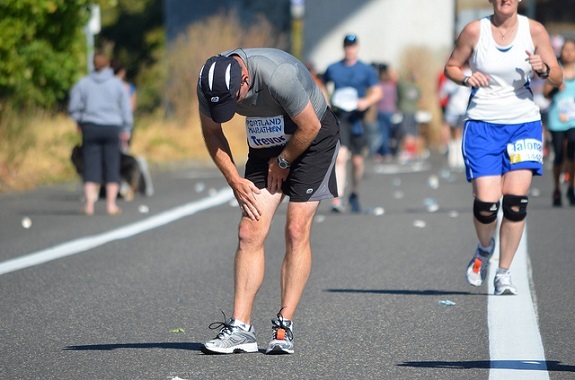 Recovering from a sports injury can take you a while, depending on what happened. Although it can be frustrating, the most important thing is to take things slowly. Your favorite sport or exercise isn’t going to go anywhere while you recover.